When you think of children’s music in the United States, you don’t automatically think of Indian music. And when you think of children’s music in other languages, you don’t often think of music sung in Hindi or Gujarati. Well, that is all about to change. 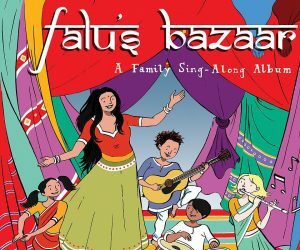 Falu’s Bazaar, the debut children’s album from established adult music performer Falu, has arrived and it is so much fun. The ten tracks on the album follow children on a journey to the Hulululu Bazaar. The journey takes them on the bus where languages from around the world are spoken, through the bazaar filled with spices and foods and to a kitchen where all that goes into cooking is explored. Along the way, listeners are also given lessons in shapes, geography and the colors of the rainbow. Both Hindi and English are featured on the album as well as Gujarati on the final song, “Nishaad’s Lullaby” which is performed by Falu’s mother. Most of the songs are short enough and have enough repetition to be used in storytimes or other programming. With gorgeous vocals, amazing instrumentation and a very high production value, this album is a must have for all libraries. In January, I had the privilege of getting to meet and talk with Falu just a couple of weeks before her album made it’s debut. Keep reading to learn about this delightful new voice in children’s music. The main audience of this blog is librarians, teachers and parents. For those who aren’t familiar with your work, would you like to introduce yourself? My name is FALU (Falguni Shah) and I was born and raised in India. I come from a musical family and finished my Masters in Indian Classical Music in Mumbai. After that I came to US and studied American Music. Before I released my kids album Falu’s Bazaar, I recorded two albums “FORAS ROAD” representing World Music and “FALU” representing a new genre – “Indie Hindi.” After that my son was born and along with him a mother in me was also born. My son Nishaad started asking me questions like what are the names of our spices, pots and pans? Which language do we speak at home? How do we count our numbers in Hindi versus English? Those questions got me thinking about how I can raise awareness of South Asian culture and give my son an identity of what it means to be an Indian American in the US. Luckily my mom also sings and agreed to sing in my kids album Falu’s Bazaar which made it even more special as now I have my mother, and my son sing with me in this new project. I’ve tried to share South Asian culture and heritage through music and different languages in Falu’s Bazaar (English, Hindi and Gujarati). We have also tried to show our audiences how Indian Music has been passed on from one generation to another for centuries as in this album as three generations from own my family come together and share this experience with our audiences. My mom, passed on this tradition to me and now I’ll pass it on to my son and hope that he passes it on to his children so that this deep rooted tradition remains alive in our family. What made you decide to make a children’s album? This album was mainly born due to my son’s curiosity and his questions. But more importantly, I wanted to make sure he creates his own identity in this country. He inspired me to think about what a South Asian child wonders about and how he feels and thinks living an Indian American life here in the US. All these questions created a sense of wonder in me as well, and that really inspired me to make this children’s album. Tell us about the process in creating Falu’s Bazaar. I took all the hints from my little son, Nishaad. How he felt when he went to preschool – he saw that he was the only one with black hair and black eyes. How he was hesitant to open his lunch box in front of his friends because the spices made his Indian food smell stronger than a pizza. These incidents made me think about subject matters children can relate to for example, how all the children love rainbow, shapes, colors, riding a bus, picking their own vegetables and fruits from the market, counting numbers. That made me think – why don’t I bring in the educational element of learning South Asian culture through all these fun things that children love, but make them in multiple languages so they could learn counting in Hindi and English or learn the names of spices, pots and pans and colors in multiple languages. How much fun can that be for a child? The style of music that we have used is North Indian Classical Music where in we teach children in multiple languages, how to count a 7 beat rhythm cycle called RUPAK along with counting numbers from 1 through 7, and stating 7 colors of a rainbow, or teaching about 7 continents, 7 days of the week, 7 oceans, 7 Indian musical notes which are SA RE GA MA PA DHA NI SA just like DO RE MA FA SO LA TI DO. All these thoughts and topics were the main process in writing these songs. After that it was just a simple formality of arranging the music and going to the studio to record and release this music. 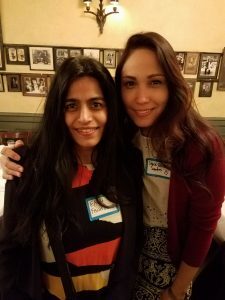 Falu (l) with fellow multi-lingual children’s performer Sonia De Los Santos in New York City, January 2018. Many of the songs include lyrics in English and Hindi with other languages being highlighted as well. Why was it important to you to make a multi-language album? India is a land of more than 25 state languages. Gujarat has a language called Gujarati, Maharashtra has a language called Marathi, Bengal has a language Bengali. Now imagine so many different languages spoken in America, for example – California has a different language, Virginia has another language, New York has a very different language than California. How would that work in America? It’s fascinating to me that in India people grow up speaking so many languages. I myself speak 5 different languages (Gujarati, Hindi, Marathi, English and Urdu) and sing in many more languages including Sanskrit. So I feel learning multiple languages could be important for a child as it broadens their minds. It was important for me to show kids how so many languages exist in this world, how people can respect other cultures and exist peacefully with each other in spite of our differences. I tried to show it through singing in different languages in the album. More importantly I firmly believe that once a child’s mother tongue is lost, it is very easy for a child to also lose his culture and his roots of where he or she comes from. So at our house we only speak in our mother tongue Gujarati. Both your son and your mother appear on the album. How did that come about? My mom is a singer and music runs in my family so my son also got those musical genes. I found out when he was 18 months old that he could sing and he has perfect pitch so I decided to include all three generations in this album, sort of create a family legacy album that my child, grandchildren and great grandchildren can enjoy! I’ve too many dreams to name one. I will continue touring with my children’s music in the afternoon and my adult Bollywood Orchestra at night. Since they share the same musicians, we plan to do two sets in any given venue – one for kids and one for grown ups. Right now we are touring with Falu’s Bazaar and Falu’s Bollywood Orchestra and really trying to promote our kids album out there so more and more kids can enjoy diversity in music and learn about different cultures and languages in the world.